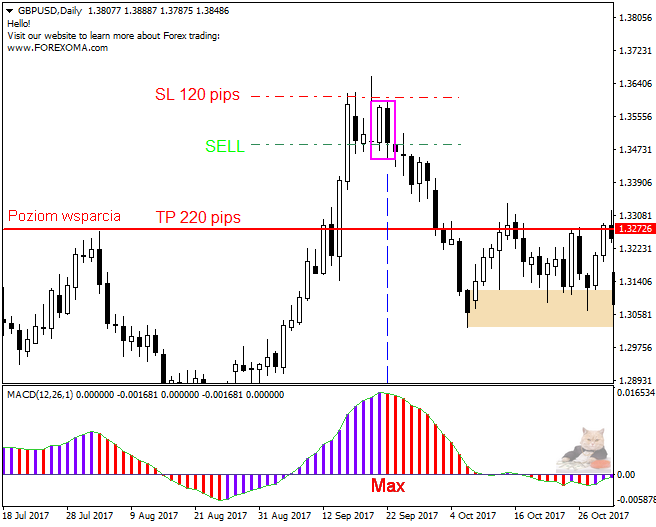 While trading on the forex market I had opportunity to test a dozen of indicators offered by the MT4 platform, which I one by one eliminated from my charts to finally find out that the vast majority of these tools actually bother me more than helps. Excess information that indicators provide, often conflicting, cause uncertainty, frustration and opening orders under the influence of bad emotions, and in fact, everything that is needed to predict price movements gives us observing the price movement. How I use EMA in my trading I described in the article: “Trading based on the exponential average EMA 144”, and how I use MACD I will describe in today’s art. The MACD indicator [Moving Average Convergence / Divergence] – was constructed by analyst Gerard Appel in 1979. The indicator examines the convergence and divergence of moving averages. It is the difference between long-term value and short-term exponential average. It belongs to the group of oscillators. the colour of the next “bar” of the histogram changes to red when MACD decreases and to blue when the indicator grows. What does the MACD tell me? The basic question we ask ourselves when trading on the forex market is – will a given financial instrument grow or will it fall …? and basically the answer to this question is all we need. MACD in some situations can help us find this answer. Below are two ways I use this oscillator. When the value of the indicator moves in the opposite direction to the price, we say that there was divergence. In the chart below, it is very easy to notice. 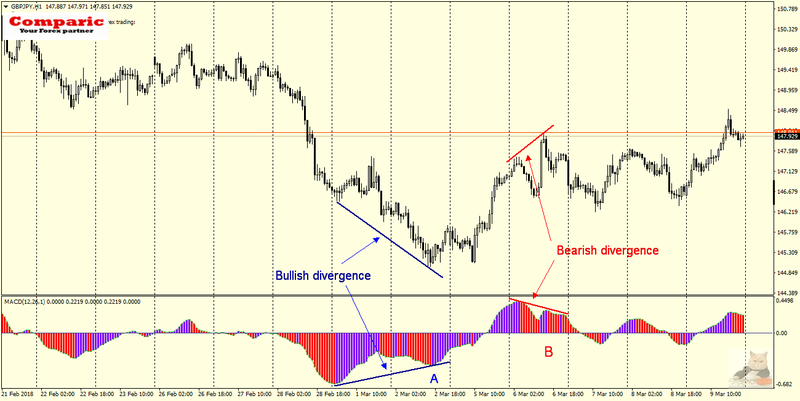 There are two divergences – bullish (upward) and bearish (downward). In the first case, when the MACD begins to grow (point A), it heralds a change in the upward trend. 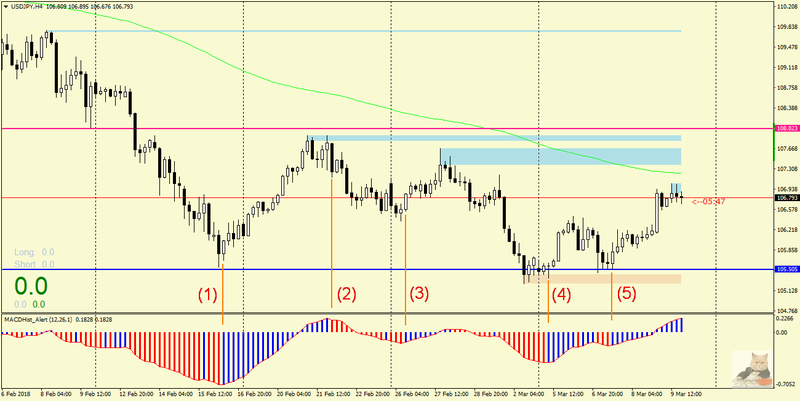 In the second when the indicator starts to decrease (B) the trend changes to a downward trend. Using the indicator in this way, we have a good chance to correctly predict whether the price will rise or fall in the near future. Of course, you should look for further confirmation in the price behaviour, the probability of the event will increase if divergences occur at important levels of support or resistance and (or) are supported by some Price Action formation like Inside, Outside Bars, PinBars or H&S. 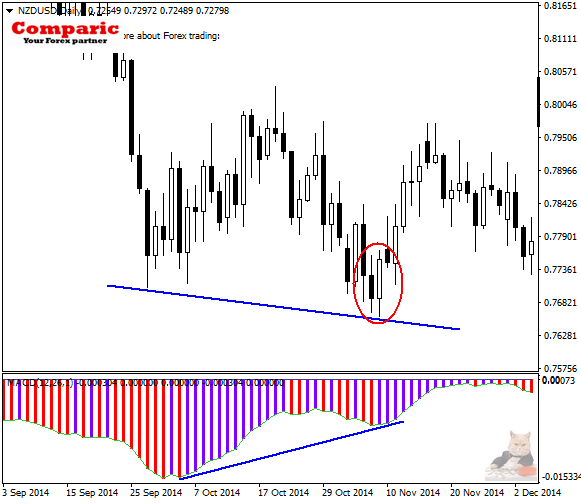 The example chart of NZDUSD Daily presents just such a situation, where the upward divergence is supported by the bullish formation of Price Action -Outside Bar (circled in red), the so-called Bullish Engulfing (the description of this formation can be found here). So we have a double confirmation that there may be a change in the trend. In this case, the move was significant because during the six sessions it gave nearly 300 pips. 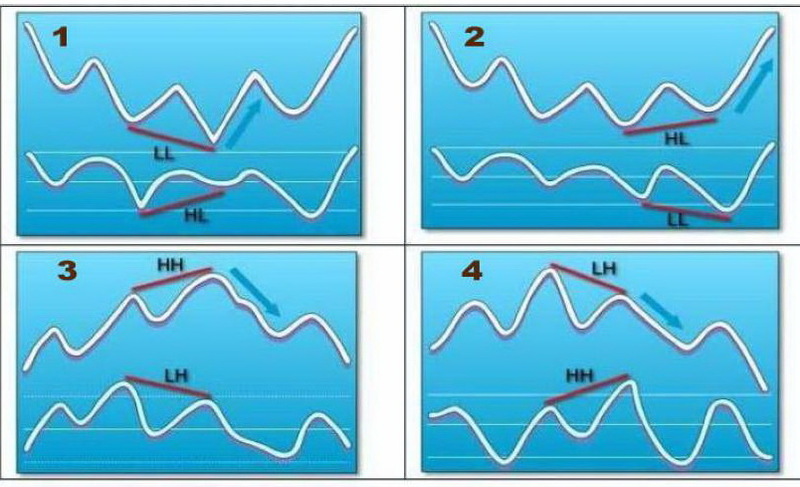 Experienced traders will notice divergences on the charts without any problem, however, for the less-experienced ones, the following picture showing in a schematic way all the common types of divergence between the price graph and the MACD histogram can be useful. II. Maximum and minimum – a signal to change the trend? As I mentioned earlier, if such a maximum or minimum occurs when the price reaches an important level – the probability of a change in the direction in which the price will go, increases significantly, and the move may have a large range. In the case of (1) and (2) we have confirmation of the Price Action – Inside Bar formations, and in the case of (4) and (5) Outside Bar and increases or decreases after breaking out from them. 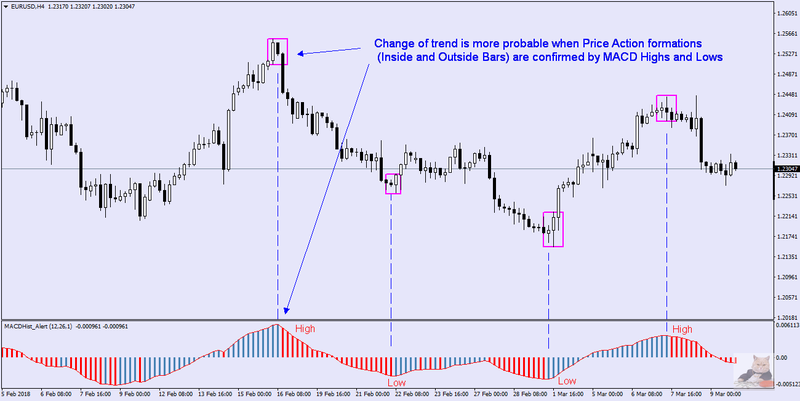 From my experience, this way of determining the trend change (these are usually local, short-term changes) gives the best results at higher time intervals – H4 and D1. 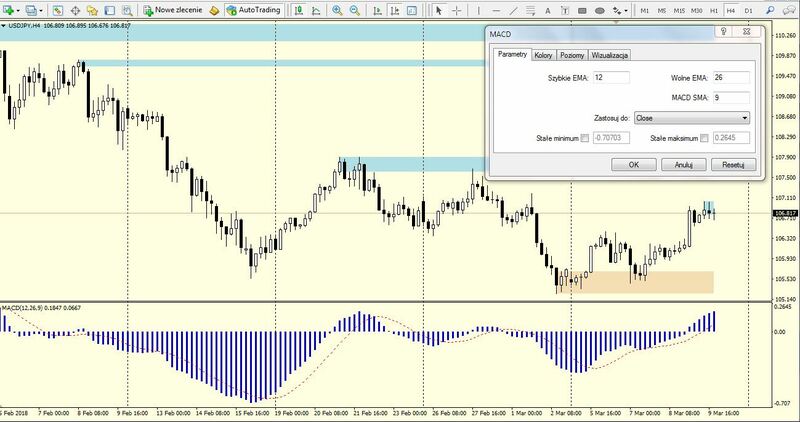 We search on a chart (H4, D1) of any currency pair or other financial instrument situation where the MACD changed direction -for example – began to decrease, the first red bar appeared on the histogram, ie the maximum was created. We calculate the size of SL, which should be above the “mother” candle, i.e. forming IB or OB. If it is acceptable to us and the nearest support level is so far away that the risk/reward ratio is favourable, we open the SELL order. If you feel that you need assistance and more practical knowledge, if you are interested in this strategy and would like to learn more about it and test it on the real market, join our group on Facebook (https://www.facebook.com/groups/328412937935363/ )where you can take advantage of current daily analyses and order an additional training course.